Since Projectfork is Open-Source and users are free to modify the code and language, any type of company can use Projectfork and customize the experience for their customers and employees. Projectfork is perfect for web design firms, software development companies, real estate companies, retail stores, and just about any company needing simple project management and time tracking. 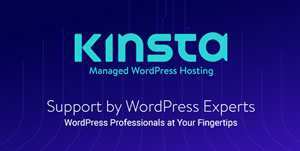 Projectfork is even being used on an internal site from Linux.com! Projectfork has all the features that have become standards in project management software such as Projects, Milestones, Tasks, Time Tracking, Calendar, Message Board, File Manager, User Profiles, and User Groups. One of the biggest advantages of hosting your own project manager is the fact that your server space is the only limitation on files and also that you have full access to data and aren’t limited in any way by the number of users, projects, etc. 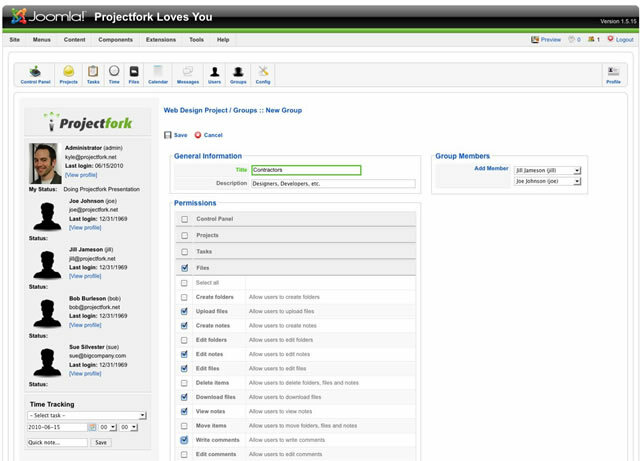 Projectfork gives you the option of using permissions based on Joomla’s core users groups (Public, Registered, Author, Editor, Publisher, Manager, Administrator and Super Administrator), but you’ll probably want to dig into User Groups for creating custom access and permissions for groups of users you create. Already have your users in Joomla? Want VirtueMart shoppers to easily be added to projects? How about JomSocial users being able to see their project activity in their social profile? This is all possible since Projectfork is a Joomla! component. The main Projectfork component is completely free to use and modify under the GPL Open-Source license. I own a web design firm and will be creating different projects for each different job I get. I want to retain global control over everything. I will add a project manager from my company that can do anything for a particular project. I will then add contractors that will have a good bit of access, but won’t be managers. Lastly, I will add stakeholders from the client company that have limited access. 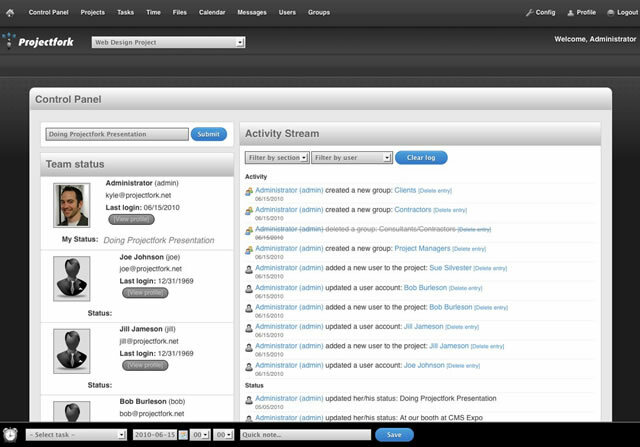 The project manager will be adding contractors and clients, and have the ability to add,edit and delete anything. The contractors will be able to upload and delete files, complete tasks and communicate with the clients. The clients will only be able to view and comment on everything, as well as upload files, but not delete them. I’d like for the project managers to appear stand-alone, as an intranet. All users except myself will login directly into the intranet and not see the normal site. I’ll also want to check in on progress from my iPhone. Projectfork comes with a complete extendable framework much like Joomla’s, with themes and extensions. Projectfork 3rd party developers are starting to pop up. AThomp Tech offers some very cool extensions. The main project management component that comes with most of the features I need out of the box. The Projectfork core component is completely free and GPL licensed. Premium theme: A slick theme that transforms Projectfork into a tactile User Interface in the web browser or on the iPhone. Premium extension: An updated list of activity from project members across all areas of Projectfork. This activity stream can also feed into Community Builder or JomSocial via plugins. Premium extension: A way to update your status and view your team’s status. The status is also fed into the Activity Stream. 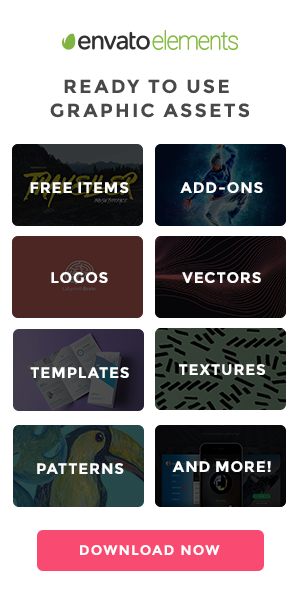 TIP: You can grab all the premium Projectfork themes and extensions in the Projectfork Bundle, which is currently 99 bucks for 1 year of access and new releases. Joomla! is required. 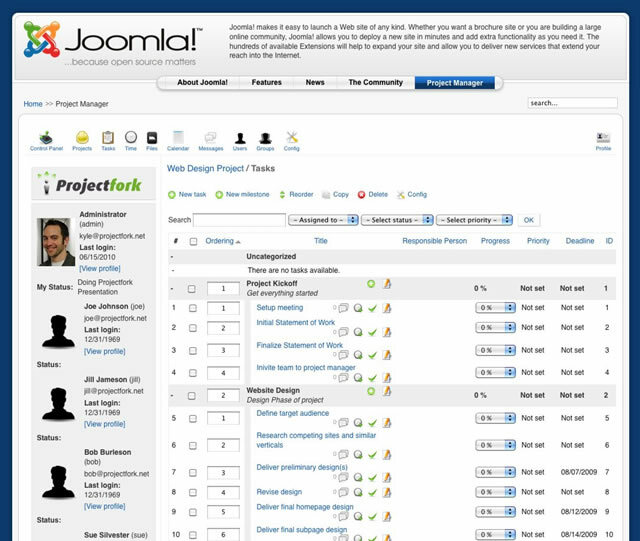 Projectfork currently supports version Joomla! 1.5, and 1.6 support is in the works. Projectfork installs via Joomla’s normal installer, then goes through an automated setup process upon first visit. I can choose whether to install sample data or not, I’m going to do a clean install this time. Projectfork has its own installer for themes and extensions after that point. Each extension type has its own Config page, from which extensions are installed and enabled. Now to the fun part. We’ll go through all the different steps in setting up my project workspace. Creating a project is simple. All that’s required is a project title, but I can also add a description, deadline, choose whether the project is public and if people can request to join (I’ll leave both turned off), upload a company logo, and even add members to the project (I’ll do this in the next step though). I can either add completely new users to my Joomla! installation or import users that are already in the system. My clients are new, so I’ll need to add them. My project managers and contractors have worked for me before, so I’ll import them. I don’t want my clients, contractors, or project managers accessing any other part of my Joomla! site, so I want to keep them all as regular Registered users in Joomla! To give them specific permissions in Projectfork I’ll create 3 User Groups for them. When creating a new group, I just check the different sections and then the privileges the group gets. I can also add members to groups at this point. 1. Project Managers: I want this group to be able to do everything, so for each section I use the hand ‘Select All’ checkbox. I then add my 1 project manager user. 2. Contractors: Contractors get lots of privileges, but not all, so I check off all the things I want them to be able to do like ‘Upload Files’ and ‘Edit Files’. I have 2 contractors so I add them now. Now that I’m all setup, I can go through each section and add Milestones, Tasks, Files, Events, etc. 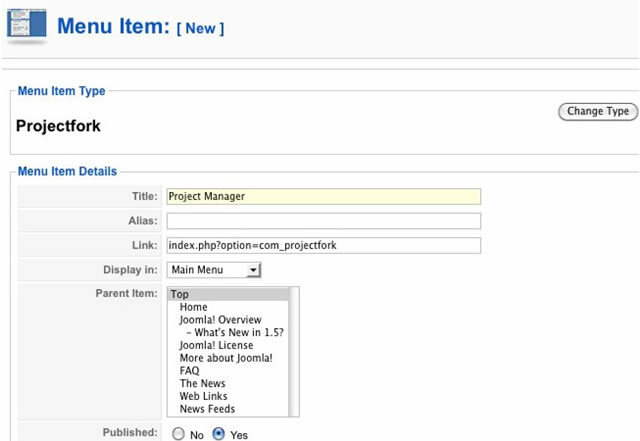 For Projectfork to be visible from the public frontend of Joomla!, a menu item must be added, linking to Projectfork. You can name the menu item anything, I’ve named mine “Project Manager”. 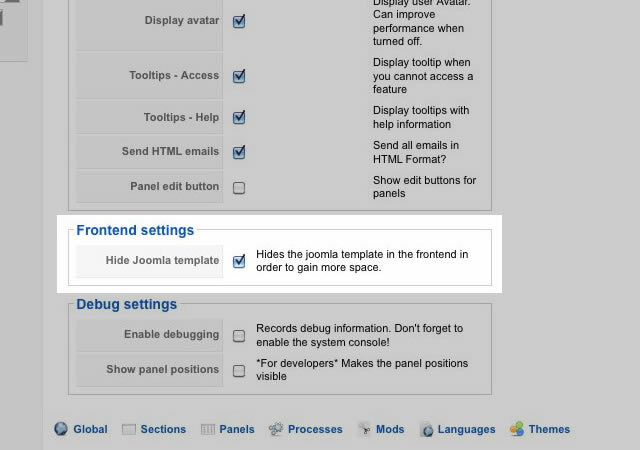 Found in the Config, this option hides the surrounding Joomla! template for all Projectfork pages, thus giving it the fullscreen appearance of an intranet. This option only works on the public frontend. Many of those same users that were attracted to the simple features of Basecamp and the ease of launching an implementation are now frustrated with the rising monthly costs, limitation of features and lack of access to the data. In this respect Projectfork has become more useful for many previous Basecamp users. Suddenly companies with limited budgets and the need for custom feature sets can obtain a rich, interactive website with Joomla! and an equally powerful project manager with Projectfork. Even if you aren’t currently using Joomla! for you website, you can validate giving it a try entirely for Projectfork to create a Do-it-yourself project manager.